Script coverage. We all know that for agents and producers, it's a great tool because a script reader can wade through a pile of scripts and find the good writers and good stories, then write up a brief script coverage and let her boss know, in a page or two, what's worth reading, and what's not. And it's a great tool for screenwriters as well. 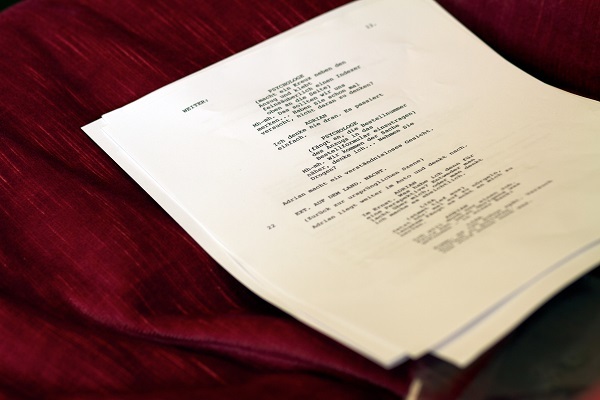 A well-written script coverage can help pinpoint how to improve story and character, plot and conflict, and so many other categories, making it a lot easier for the screenwriter to know where to begin fixing things on the next draft. But did you have any idea that script coverage is also a great tool for independent filmmakers, and can actually help get projects off the ground? In the mid-2000's, my production company and I were looking to get a feature film produced for one of my screenplays, Frampton Damper — a dark romantic comedy about a sick man and a nurse. Raising money for the film was a tough climb, but we were able to get assurances from one large production company, with a deal at a major studio, that they'd be happy to bankroll our $1.2 million-budgeted film if we were able to attach two A-list stars. We suggested Maggie Gyllenhaal and John Goodman. They said "If you guys get those two aboard, we're in." (b) an amazing screenplay that was, without question, a fun read and a clear, shootable, realistic blueprint for a great independent romantic comedy that would appeal to both of our targeted actors. The first thing, the money in the bank, was being taken care of by one of our initial producers, who agreed to fund our production company to the point of being able to make a serious offer to the name talent. The money he was to put in, however, was to scale up with the size of the talent we were to procure. That is, he made most of his funding contingent on who we got to agree to star in the film. The second thing was the script. And that was crucial. We had one shot with each of these actors. If they didn't like the screenplay, they wouldn't agree to do the film. Or, more accurately, if the agent or agent's assistant who read the screenplay before giving it to the actor didn't like the film, we'd be hosed. So the screenplay had to be tight. But being the writer, I felt I was too close to it to be able to critique it and improve it. That's where the script coverage came in. I started a script coverage service in 1999, which turned into the script company I run now called Screenplay Readers. So when we needed to make our script as strong as possible before sending it out to those name actors' agents, we ran it by several of my teammates at Screenplay Readers. We didn't tell them it was me who wrote the script, because we didn't want to bias their read, so I used a fake name on the title page. When the coverage came in from the reader, they'd spotted several key places where the script could be stronger, and made suggestions on how to do so. And you can bet me and my producers took full advantage of the script notes to improve the script. Not only did the readers’ script feedback help me improve the script thematically and structurally, it actually pointed out several glaring typos and errors that somehow made it past me. Had we sent that script in to the name actors we were trying to attach to the film, those errors could’ve made my producer team and myself look like rank amateurs, which is not the vibe you’re trying to transmit when you’re trying to secure name talent aboard your tiny indie project. So I rewrote the script based on the script coverage, and I fixed all the errors. But by then the producers and I decided to try a different strategy. Instead of sending the script directly to the A-list talent, Gyllenhaal and Goodman, we felt we should maybe give the project more of a “moving train” feel to it by seeing if we couldn’t attach some great actors with less star power, but whom those two actors had worked with previously, or who they had great respect for. To that end, we contacted Swoosie Kurtz's agent and asked if we could send the script. After a bit of back and forth moving our schedule around for the possibility of Ms. Kurtz, condensing days she'd be shooting, etc., they asked to read the script. But before we sent it in, we decided to get another round of script coverage from my readers. This time, we asked for focus to be placed on the character that Ms. Kurtz would be playing. The coverage that came in a few days later commented on some aspects of the screenplay that the previous readers hadn't, but offered a few other specific notes that really helped boost the character we requested the script reader focus on, as well as script notes on a few of the other characters that had not been commented on in the previous coverage. The result was that we now had an even stronger screenplay. We sent it to Ms. Kurtz, made the cash offer, and she was officially aboard. Her joining made it a lot easier for us to then approach Ed Begley Jr.'s people, because they respected and admired Ms. Kurtz's work. After a few scheduling tweaks and backs-and-forth with the deal memo, Begley was aboard. With those two name actors aboard, we felt confident we could now get either Goodman or Gyllenhaal aboard. We had a great script, thanks to copious rounds of notes that included free writers group feedback and paid script coverage from my script coverage service, and we had money in the bank ready to make solid offers. But then both John and Maggie were suddenly on other pictures, and despite our attempts to reschedule our picture around them, those two were suddenly unavailable and out of reach for the next year or so. We were a bit distraught, having done all this legwork and tweaking the script around the script coverage we received, and finagling with the producer putting up the funds to make the offers. But we were soon back in business again. Natasha Lyonne at the time was in between films and had happened on my screenplay because we'd sent it to her agent some months earlier, hoping to get her to play the part of what was essentially an offbeat, co-lead character. The part was virtually written around her: tough, but lovable, and hopelessly weird. She's good at those roles. Long story short, we met with her and she said she loved the script and would love to do the film. In a subsequent meeting, she specifically mentioned she connected with the character’s flaws and at least one particular plot twist that was incorporated into the script after we received the first round of script coverage. With Lyonne aboard, we were able to secure almost full funding from a new production company we'd been courting. We just needed one more name to make the film a full "go." That "go," sadly, never materialized, however, as the LLC dissolved suddenly for a variety of financial and personal reasons. The film we were making, with all these great name actors, became hopelessly mired, and we eventually lost our name talent. The film never got made. But the net takeaway was that without that script coverage, I'm not sure we would have had any of the success in securing any of those actors on our film. Script coverage can be a boon, yes. Script coverage can help get name talent aboard, and therefore help make financing a lot easier, yes. But is it the only way to get script feedback? No. It was just the fastest and most efficient for us. Sure, I could've sat in a writers group and waited for my turn to do a table read and could've gotten some great free feedback from the writers in the group. Sure, I could've, and did, receive free feedback from fellow filmmakers and friends, but it wasn't always as concise or critical as I felt it needed to be. The bottom line is that script coverage services are there to be used, and not just in a creative capacity, but in a strategic, fundraising capacity. If you can make your script better, or shore it up in key areas, or increase its readability in any way, or help find glitches that could mark you as an amateur, it makes no sense to not use one to help your film get off the ground. That being said, as the owner of a script coverage service with almost 20 years of experience, I'm biased. So I'll tell you this: script coverage can help, a lot. But do your research and find the script readers or script coverage company that fits you best. They're not all the same. Script coverage might not the end-all-be-all answer for your film getting off the ground, but it sure helped me get the name talent I needed for mine.